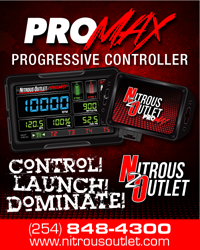 We have reached the end of Pro Stock’s viability as a category of competition. It’s time for NHRA to face reality and announce that 2017 will be the last year the class will be part of the Mello Yello series. I’ll repeat what I’ve written many times before: Pro Stock has been, without question, one of my favorite categories of competition. I may not know a carburetor – or a fuel injector, for that matter – from an intake valve, but I know good racing when I see it, and what NHRA is putting out on the track is anything but good. It’s disastrous, meaningless and continues to be boring as hell. Small wonder that the fans continue to desert the stands in massive numbers when the cars come rolling out of the staging lanes. They’ve learned there’s more excitement back in the pits, waiting in the hot sun for an Alexis DeJoria autograph, than can be found on the track when Pro Stock is running. Some days are better served just by calling in sick. I had never wished a stomach virus or any other illness on myself, but with hindsight being 20/20, I wish I had been sick as a dog this past Saturday. The second day of the Professional Drag Racers Association [PDRA] Spring Nationals dawned with a strange sense, at least for me, that something just wasn't right. It was windy, cold and not the kind of day you ever wanted for a drag race. I could see this one coming a quarter-mile away. NHRA’s Brave New World of self-produced TV coverage on Fox Sports is exactly one race old. And, sure enough, some “Go Back to ESPN” deep thinkers have already taken to social media to share their insights. I’m sure the Environmental Protection Agency does many wonderful things to protect our natural resources but, like any bureaucracy, it also seems to create projects designed simply to justify its own existence. A case in point is a proposed regulation hidden within the most recent rules package the EPA submitted to Congress. Simply, if enacted, it would make it illegal to transform a street car into a race car. On the surface, it sounds like a joke, but when you dig deeper, you understand that while it may be silly, it’s no joke. What it is, is ridiculous and ridiculous on so many levels. .
UP FRONT WITH JON ASHER: NO POINTS FOR RECORDS? WHY NOT? At a moment in time that may be the most critical ever for the National Hot Rod Association a decision has been made by management, one that escapes logic. We’re talking about the abandonment of providing championship points for national elapsed time records in the professional classes. Think, for just a moment, about “where” NHRA is as the 2016 season dawns. A brand new and seemingly promising television package with FOX Sports is about the debut with at least one untried studio commentator. There's also a new Pro Stock. Meanwhile, outside of the broadcast center there’s the ascension of Peter Clifford to the top management position. While that promotion came more than six months ago, this year will mark the first time Clifford has been the sole decision-maker, so this puts him squarely in the spotlight. Read more about UP FRONT WITH JON ASHER: NO POINTS FOR RECORDS? WHY NOT? Optimism, op·ti·mism, /ˈäptəˌmizəm/ - hopefulness and confidence about the future or the successful outcome of something. While I have written professionally now for almost three decades, the upcoming NHRA season marks the most optimistic new season in a long time. While there are those who find fault in the Glendora gang regardless of what they do or attempt to do, in looking at the recent moves being made behind the scenes, I see a genuine attempt to fix wrongs perpetrated over the last decade. A hearty Happy New Year’s to all CompetitionPlus.com readers. That being said, it’s time for this column’s annual listing of the year’s Top 10 stories in the Business and Politics of Drag Racing. Diversity in NHRA drag racing, taken in the historic sense, undeniably is a right fulfilled, a blessing, a mark of acceptance, welcome, and forward-thinking. But frankly, in its practical sense, diversity has become an exhausted buzzword. With Top Fuel’s Antron Brown and Pro Stock’s Erica Enders clinching their respective series championships last weekend at The Strip at Las Vegas Motor Speedway, the tattered old blanket has been hauled out of the closet and paraded around again.